Rating: 4/5 – Stylish Art Brings This Action Movie on Paper to Life! I first saw, and fell in love with, Des Taylor’s art when I saw the digital comic The Trouble With Katie Rogers back in January 2014. I’ve been following him ever since, I really dig the slick digital style he brings to the comics page. When I first saw the announcement that he was creating a new series for Titan I couldn’t wait to see it. This debut issue delivered pretty much what I was expecting to see; stylish art and action set in a world rife with intrigue, fashion, and pretty women. Scarlett is head of security for her Mother’s high-fashion company Chase Couture. She is also a secret agent on the side which comes in handy when the New York fashion world intersects with an international terrorist plot. 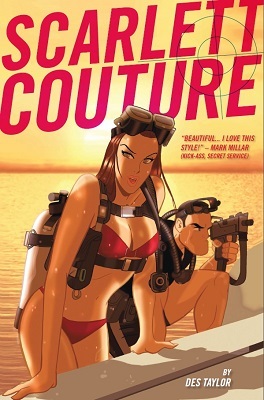 Pretty models, kidnappings, gunfights, explosions, this comic has them all, it’s a summer action movie on paper. Like an action movie, I sat back and let the story carry me through while not over-analyzing the details. Look too closely at this book and, just like an action movie, you may notice the plot is a bit thin in places. Taylor over-uses blur effects in his art a bit, kind of a print analog for me of a movie director over-using slow motion. I can forgive these because I was entertained from start to finish. The best part about Scarlett Couture was the look. It’s unlike any other comic on the stands, and Des Taylor’s distinctive art style was very appealing to me. There was a good blend of action along with the necessary introductions of the characters, settings, and establishing the point of conflict. A nice hook on the last page got me wanting to come back to see what happens next, an essential part of a serialized monthly comic. I’m excited to see where Taylor is going with the story and hope it’s only the first of many story arc with these characters. I’d love to see Taylor’s work gracing the stands on a very regular basis. This entry was posted in Titan and tagged Des Taylor, Fashion, Scarlett Couture, Spies, Titan. Bookmark the permalink.